Yes Avi risk definitely significant! In Font Romeu and Cambe d’Aze things not quite as severe, Font Romeu has now opened virtually its entire area and Cambe d’Aze gradually getting there, now 75% of reds open, blacks will take a bit more consolidation. Les Angles has prob had the heaviest of the snow and Avi risk there 4/5 minimum....so the ongoing closure of the right teleski, runs related to that and the Costa Verde bowl likely related to Avi risk rather than lack of snow. As always, take care out there. It seems to keep on snowing... Les Angles now up to 120/170 and forecast doesn't seem to relent with apparent snow forecast in a 1 in 3 ratio next couple of weeks. Just hope the Avi risk can be managed as the snow continues to fall so they can take advantage and open any remaining runs that haven't stabilised enough. Soldeu webcam has shown it snowing for five days solid. Driving to Soldeu from Toulouse in a weeks time, slightly concerned about road closures........any good websites for traffic information. The road you will be taking (from Ax-les-Thermes to Pas de la Casa) does get very snowy, so make sure you have chains (and know how to use them). But I wouldn't be overly concerned. The Andorrans are usually very punctual about clearing the roads as fast as possible (their livelyhood depends on it! ), so you will probably only need chains if you are caught in a snow-storm while driving, or driving the morning after a heavy dump. Mobilitat.ad is in Catalan but has a good map showing the road conditions and mostly inportantly whetger any roads are closed. Indeed. Les Angles have been promoting their avalanche prevention on the Costa Verde so it would appear that their blacks will open once they are happy they are safe. Anyone have a bit of insider info on Espace c'Ambre d'Aze however? It's a bit odd, they seem to be getting the snow on the webcams but the published snow depths have remained rather stubbornly at 50/70cm and the top right teleski is still closed. So 4 of their best runs are still closed. Anyone know whether they have just genuinely missed the snowfall, or there may still be an avi risk on the upper slopes? Or perhaps the top teleski may be closed due to a technical fault? I know they have been struggling financially recently which is a pity as their blacks and reds are long, steep and challenging compared to other Pyrenean resorts. Looking at the Pyrénées on my dog walk this morning, I suspect today is going to be the best day of the season - plenty of fresh snow & plenty of lovely sunshine. 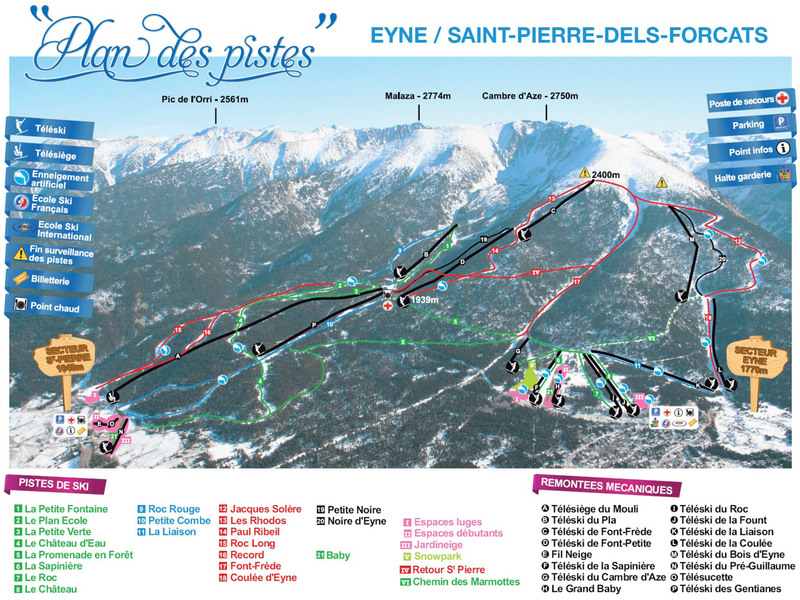 In terms of those 3 resorts, Porte Puymerons has the best snow and off piste potential (but least trees) Font Romeu will have plenty of runs, the most trees, quite a few blacks, but less altitude difference and off piste would be primarily going in between runs, not separate itineries. Formigueres is probably the smallest of the ski areas and I've only been there once- not too sure about off piste potential- has a few trees though, but only on one side. Altitude difference in between the other two. That's true, it's one of my favourite resorts, though you need to be prepared as a boarder to take a lot of steep drag lifts! And at the mo the top right drag isn't open and snow apparently is less deep than others. However it has great off piste, lovely treelined runs and a decent gradient for the Pyrenees- lovely rolling slopes. Well the snow has finally arrived. A somewhat frustrating day yesterday in Baqueira with the snow Saturday and high winds keeping a lot of the mountain closed. This of course resulted in queues and busy pistes as people were keen to get up the mountain. As the mountain is made safe and the areas open up there's going to be some epic skiing to be had. Conditions look like they're going to be pretty good all week and I plan to be catching up after zero days in January !!!! Yup looks good for the coming week...weather looks stable, hopefully we don't get another long term anti cyclone though! @mrvinegar, Formigueres has some excellent off-piste and is known locally for attracting more snow than Les Angles which was certainly the case when I visited- waist deep powder! Seems to be warming up again with a sprinkling of rain but good weather and low winds. Am I right in thinking that a small amount of rain is not a bad thing in terms of stabilising the snow? The same cannot be said fro Pal, Andorra today. Sun was intermittent. The wind on top was strong and blew snow all around. Snow was deep between the trees. Arinsal was still closed (as Pyremaniac said). I went for a quick skimo around lunch time yesterday and fell in to my waist before getting on to the skis. It's quite an exercise in agile awareness for a 50yr+ old when your skis are at waist level and you have to figure how to get your feet on top of them! I suspect Arcalis wil be great tomorrow - heading there early. Hi, will you be around Feb 9-16? Looking for a buddy for some skimo in the area? Thanks! Anyone been up since that rain on Monday? Did it do much damage? My other half's in Baqueira at the mo. She didn't ski at all yesterday due to the rain. I may find out later today as to the consequences. Apparently, only the lower slopes (of Baqueria) suffered a tad: degraded, but not slush or worse. It was a good day's skiing today albeit a tad cloudy/overcast at times. So how are conditions? Powder is gone but how is snow in offpiste? Looks like sunblock is needed next week. Yesterday was hard pack and poor light (Baqueira). Today it looked pretty sunny over the Pyrénées, but I haven't yet heard how it actually was on piste today. I'm off to Grand Tourmalet & Ardiden next week, so yeah, looks like sunbathing weather. Today at Baqueria was perfect conditions, i.e. sunny & perfect pistes (for skiers). Anybody with local knowledge of the Ushuaia Mountain Hotel in Arinsal? We're looking to book a cheeky week for the 3rd of March. I believe it's right next to the Josep Serra chairlift. My main question is would that chair be open if there isn't enough snow to ski down to it? Also is it possible to come down on the chair rather than taking the gondola and walking back to the hotel? Went to Les Angles today, spring conditions, on piste snow was good, especially higher up, all the off piste was crust unfortunately..
A couple of excellent days touring near Ascou in France and Pas in Andorra. Patches of good snow, but lots of crusty stuff if you didn't catch it the right time of day. Off to Baqueira for a few days with friends from the UK. Looking like lots of suncream will be needed. Looks like the high-pressure is gong to continue to at least next Sunday. Anyone else reading it the same way? Looks settled for the foreseeable future. The promised sun didn't arrive today, which ended up being cloudy with a few clear spells. A few cms of fresh covered crusty rain affected snow anywhere that hadn't been bashed. Some wind at altitude meaning some of the steeper runs not opening. On piste conditions are excellent. Not too busy. A few Spanish school groups around, but no queuing and pistes pretty empty except the usual run down to 1500 at the end of the day. Hopefully, some sun tomorrow to soften up the lumpy stuff. Sun all day, quiet piste and lifts. Weather looks good for next few days. Got a trip to baqueira in two weeks so I'll be watching this thread with interest. Long term forecasts showing snow at the end of the month, not much until then. Traditionally end of Feb / start of March delivers big snow in the Pyrenees, hopefully that tradition continues! Hopefully you are right Mr vinegar. Baqueira with fresh powder was like an epiphany for me. Our first day on the mountain this year is 28th Feb so if tradition could oblige I'd be grateful. Staying in pont d'arros just outside vielha. Say we get flat light/low visibility. Has anyone done the drive from vielha to espot/sort during winter? If so what's it like and are those hills any better in low visibility ?